Can refocusing conversations between doctors and their patients lead to better health? Despite modern medicine’s infatuation with high-tech gadgetry, the single most powerful diagnostic tool is the doctor-patient conversation, which can uncover the lion’s share of illnesses. 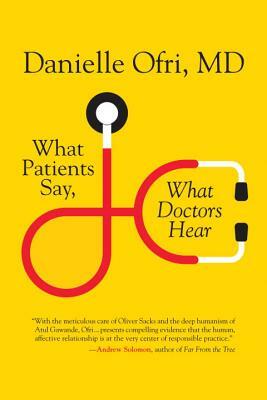 However, what patients say and what doctors hear are often two vastly different things. Patients, anxious to convey their symptoms, feel an urgency to “make their case” to their doctors. Doctors, under pressure to be efficient, multitask while patients speak and often miss the key elements. Add in stereotypes, unconscious bias, conflicting agendas, and fear of lawsuits and the risk of misdiagnosis and medical errors multiplies dangerously. Though the gulf between what patients say and what doctors hear is often wide, Dr. Danielle Ofri proves that it doesn’t have to be. Through the powerfully resonant human stories that Dr. Ofri’s writing is renowned for, she explores the high-stakes world of doctor-patient communication that we all must navigate. Reporting on the latest research studies and interviewing scholars, doctors, and patients, Dr. Ofri reveals how better communication can lead to better health for all of us. Danielle Ofri, MD, PhD, is an associate professor of medicine at the New York University School of Medicine and has cared for patients at New York’s Bellevue Hospital for more than two decades. She is the author of, most recently, What Doctors Feel: How Emotions Affect the Practice of Medicine, as well as the critically acclaimed Singular Intimacies, Incidental Findings, Medicine in Translation, and the e-book original volume Intensive Care. Writing in the Guardian in the spring of 2016, Andrew Solomon singled out Ofri as the only woman among an extraordinary new generation of doctor writers, saying, “Ofri has produced four impressive books and numerous articles, all striking for their reversion to empathy, their willingness to sense not only the physical life of a patient, but also the emotional.” She lives in New York City. —Deborah Tannen, professor of linguistics at Georgetown University and author of You Just Don’t Understand and You’re Wearing THAT?